The fitness.uk.net website was created by personal trainers who are passionate about health and fitness, and the benefits that a healthy body provides. Its aim is simple - to provide YOU with the knowledge you need to acheieve your goals and to lead a healthy lifestyle. This forum is the sister site to fitness.uk.net and has been created so people can interact and exchange information in the area of Health & Fitness. Information on the fitness.uk.net website and the resources it contains. A section for members to open their own threads and keep a training journal. Get support & advice from other members. A chance for new members to come and say hello. A place to discuss your personal training experiences and questions. Share healthy and nutritious recipe ideas. Use this section to post links to any useful fitness / health clips you have seen! 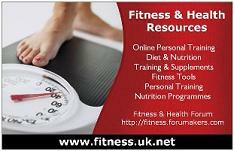 Chat about anything fitness & health related not covered in the Resource section - formal or informal! Informal chat about anything you want - keep it clean! Advertise your items for sale or advertise the fact you want something for free! A section dedicated to the unhealthy issues in life!